Lean back and enjoy the culinary adventure of the Nordic cuisine. Fresh and traditional dishes with regional ingredients: Our aspiration is to bring you the fresh breeze of the North Sea and the Elbe River right to the table. We are looking forward to your visit at our restaurant “Zur alten Mühle“. Dieter Lassmann, owner of the restaurant “Zur alten Mühle”, has been working as chef de cuisine at our restaurant for over 30 years. The trained cook knew right from the beginning about the unmistakable allurement of the old mill. Our team is devoted to your taste adventure. We put our guests first and listen to individual ideas and tastes. We want to take you on a journey through the Nordic cuisine. Perfect to end the evening of a nice city trip in Glückstadt. Located directly at the inland port of Glückstadt, you will be able to discover the feeling of the Nordic cuisine and enjoy pure freshness. Seasonal dishes and specialties of the region are on our menu – always up-to-date. Small details and the harmony of all our ingredients make the difference that you will only find at our restaurant. Among our dishes, you will of course not only find seafood – we have something for everyone’s taste. This is how we ensure the satisfaction of our guests. Take a look at our menu and discover the variety of the Nordic cuisine. Fresh ingredients and regional products are key to the perfect harmony of our creations. Our cooks regularly update the menu with seasonal highlights. If you aren’t sure what to pick, don’t worry. Simply ask one of our waiters to recommend something to you or choose a daily special. Varying specials Simply ask for our daily changing cake variations. Matie, also called soused herring, is a specialty of the Nordic cuisine. It is a pickled raw herring that is very mildly salted and easily digestible. The dish is made from immature herrings and traditionally ripened in oak barrels. This tradition came into existence in the Middle Ages. Glückstadt’s matie is known for its mild taste and sold internationally. All matie dishes come with a choice of baked potatoes or fried potatoes with bacon and onions. 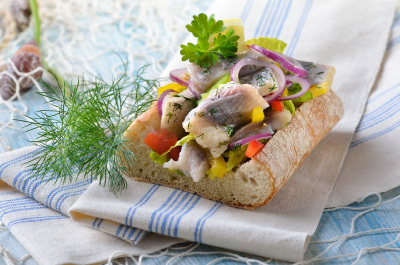 Try one of our many matie herring dishes. 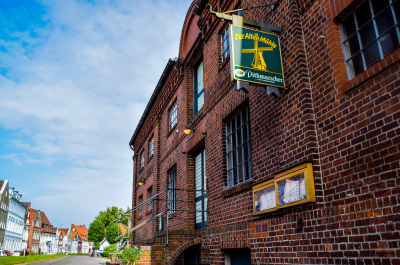 Our matie herrings are traditionally produced by Heiko Raumann in Glückstadt. He uses the original recipe of Helmut Sievers who invented the mildly salted version of the traditional dish. Along with the former mayor of Glückstadt, Dr. Manfred Bruhn, Sievers initiated Glückstadt’s matie weeks – an annual public festival in our city. Heiko Raumann has been making matie in small quantities since 1993. This is how he ensures the superb quality of the herring.